Barr	Seitz	joins	McKinsey & Company	as	Dir., Digital Publishing and Marketing	Develop, drive, and manage a global publishing and social strategy for the Marketing & Sales Practice. Alec Maki	joins	InsightsNow Inc.	as	Vice President, Product Development,	Alec will drive the company’s ambitious product strategy and roadmap for creating research products that help customers elevate new product development results, and is currently working on a social media offering to complement the InsightsNow product strategy. Mary Anglade	joins	Engage121, Inc.	as	Senior Vice President Marketing	Responsible for all marketing, branding, corporate communications and PR. Michael	Rubin	joins	Redbox	as	Senior Manager of Social Media	Responsible for developing and executing a clearly defined social media strategy to foster ongoing engagement and advocacy with redbox consumers. Somehow I missed that respected Kevin Marks joins Salesforce as Vice President of Open Cloud Standards at Salesforce.com a few months ago, congrats Kevin! Lindsay	Grubbs joins Seafoam Media	Media as an Analyst. Lindsay monitors clients’ online reputations and builds their social presences through studying analytics, building communities, and creating inspiring content. Keith	Paul joins EMC as Chief Listener developing global listening and engagement program across EMC. Lewis	Bertolucci joins Humana Inc. as Social Media Marketing Consultant	Responsible for developing, socializing and driving the Humana Social Media strategy across the Enterprise. Al	Wood	Tapjoy	Chief Financial Officer Al oversees all financial, human resources, legal and administrative functions of the company. Joe	Millward joins Snowy Hydro as Digital Communications Specialist	Develop and implement the internal and external digital and social media communication strategy for Snowy Hydro. Up front disclosure: Altimeter believes in fostering trust with the market, and we disclose who our clients are, providing they agree. Some of the vendors listed below are clients. Overall, the Social Media Management System (SMMS) space lacks market differentiation when it comes to market positioning, which is often reflective of feature set. Furthermore, many of these low-barrier technologies are being developed rapidly, and a feature war has set in. As a result, buyers are often confused, resulting in longer evaluation and consideration phase, and heterogenous mix of vendors in an RFP processes. Furthermore, the lack of market differentiation hurts vendors, who may have greater sales costs, and longer sales cycles during a convoluted RFP process. This is normal in an emerging market, and expect the maturity of the nascent SMMS space to follow similar patterns to the maturing Community Platform space. Buyers often indicate they are very confused by the vendors in the Social Media Management Systems space, let’s probe to find out why. One initial observation is the explosion of over 25 vendors in a short period of time, the following analysis is based of the following vendors: Argyle Social, Awareness Networks, Buddy Media, Constant Contact, Context Optional, Conversocial, CoTweet, Engage Sciences, Expion, Hootsuite, MediaFunnel, Moderation Marketplace, Mutual Mind, Objective Marketer, Postling, Seesmic, Shoutlet, SocialVolt, SpredFast, Sprinklr, StrongMail, Syncapse, Vitrue, and Wildfire. Messaging is often the first thing prospects see and as a result, where I will focus today. Why? This is the first thing that buyers see (positioning) before even evaluating the feature set. Furthermore, I’ve done a similar exercise before with the community platform space a few years ago, a space I draw clear parallels as the SMMS space follows suit. Clearly this isn’t a comparison of features or offerings (we may do this in our next report), but a sampling of what prospects see as they first glance at this emerging and growing market. Here’s how I conducted this process: First, I put myself in the place of the buyer and imagined their task of sorting through this new space and short listing it. Then, I went to the website homepage and sought to find the dominant messaging that would resonate from the vendor: tag lines, descriptors or even the HTML title at top of browser. If they didn’t have this, I had to go to About page or even Product page in some examples. To show my work, I’ve also provided a Google sheet where you can see my tallies across the 25 vendors. Here’s what I found (vendor names removed) can you identify which of the messaging applies to which vendor? (answers in link below). Offers you the most comprehensive suite of features designed to take your social media campaigns to the next level. “Vendor” is a social media management system (SMMS) that helps businesses get closer to customers to create online engagement where it matters most. Is a social media publishing solution that enables marketers to monetize their investment in the channel through the proper application of proven direct marketing principles. Power your brand on Facebook + 100 other social sites Create, manage, and measure all of your social media marketing communication with one powerful but intuitive tool. Provides small businesses with the tools, alerts, and insights to get the most out of social media. To see the name of the vendor and the associated messaging above, see the answer sheet. 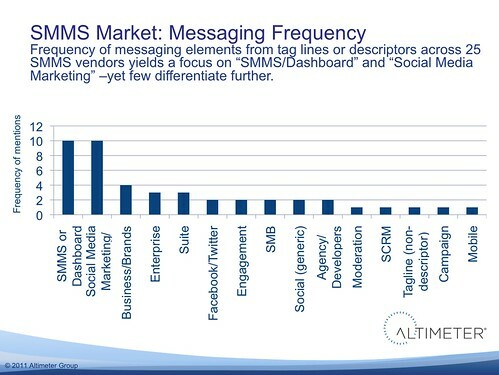 Above Graphic: Most vendors have centralized their messaging around “SMMS’ (10/25) or “Social Marketing” (10/25) yet few have evolved messaging to either specific markets, verticals. There were stronger mentions in differentiation around market purpose: with more focus on Business (4/25), Enterprise (3/25), and even SMB (2/25). However, there is differentiation in terms of channel with a peppering of mentions around Mobile, SCRM, Facebook/Twitter. Overall, when removing company name from taglines, most taglines (aside from Buddy Media) were indistinguishable from the next. Market Positioning Centered on variations of “SMMS” and “Social Marketing”. High adopt of category term, Most vendors (10/25 vendors), adopted the term Social Media Management System or Dashboard in their primary messaging. Secondly followed by high adoption of permutations on the phrase “Social media Marketing (10/25 vendors). While I certainly encourage the adoption of the term SMMS (which I use as the category name since March 2010), the term Social Media Marketing isn’t fully representative of the overall use case, which can include support and customer service. Furthermore, four of those those that did use the terms SMMS, didn’t have follow up descriptors helping to differentiate. Some Vendors Lacked Appropriate Descriptors. During my visit to all 25 vendors pages, not all of them had consistent taglines, descriptors, or positioning. In some cases, I had to go to the product pages to find out exactly what they do, which can be a turn off for buyers. I’m sure that many vendors will suggest that I got the wrong messaging they were trying to convey, but I treated each experience the same, acting like a buyer, if I didn’t get your intended message, that in itself should be evaluated, as likely your prospects may be experiencing the same. Despite a Market of 25 Vendors, Few stood out from Pack. Take a look at that list above, these positioning statements are pretty much the same, there’s no doubt why buyers are so confused. This space is confusing, they all look alike, except for Buddy Media. yet despite being the sole stand out, their tag line isn’t descriptive of what they offer, nor a value statement. Traditionally, marketing tag lines require years of investment and market awareness before shifting to a non value-statement tag line. While cute, I don’t think it’s as helpful compared to their title statement “Facebook Marketing | Social Media Marketing | Power Tools for Facebook” which is descriptive, if Buddy could merge both catch line and descriptor, they could be a contender to stand apart. Lack of Market Positioning is a sign of lack of Product Differentiation. While we’ve not made a direct causation between similar features and positioning statements, we know from vendor briefings and client meetings that the offerings are often the same. As a result, buyers rely on WOM between each other, as well as viability and vision crafted by each of these vendors. Immature Market Lacks Educated Buyers –and Vendors Not Sure Future Vision. The market confusion isn’t just stemming from the vendors, buyers are still getting educated on this space as we know that adoption is growing –slowly. Rapidly Changing Feature Set Will Continue Confusion. This space is early, it’s just over a year old from category naming and it continues to evolve. Expect the vendors to ever battle over features, matching what other competitors beat them in bids. Like the community platform space, we saw similar confusion and then market clarity as winners emerge. We’re currently doing data cuts on a survey to 140 enterprise buyers on the SMMS space, and about a similar amount for the SMB space, and have data on: number of accounts companies have to manage, number of business accounts, top feature desires, feature satisifaction, adoption rates. 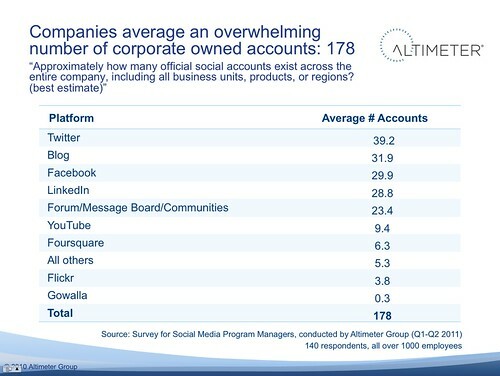 Altimeter clients have access through advisory opportunities. Also Brian Solis is helping with vendor selection for a global national brand, as do I short list for buyers. Altimeter Group will be producing a report on the SMMS space, follow me on Twitter, and Andrew Jones to learn more.